We visited Wallington hall in Northumberland for the first time this weekend. 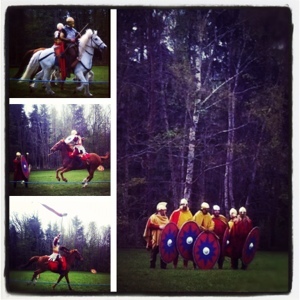 We primarily visited as they had a special event on in which the premises were invaded by Roman's. Our first part of the day was taken up with Roman activities - we bought the kids some Roman helmets so they could get into the swing of things then wandered around a Roman camp admiring traditional crafts, we met a real life Roman soldier and tried on his helmet and shield and were amazed at the skills of both the soldiers and their horses in a mock battle display in which we enjoyed cheering for our favourite soldier. This part of the day was really enjoyable for young and old and we really felt as though we were transported back in time. Hopefully the kids learned one or two things as well. For the second part of the day we explored the rest of Wallington hall and have got to say, we were really impressed with the grounds and could easily spend an afternoon here again. We had drinks on the lawn in the courtyard whilst watching an impromptu game of cricket. Here there was a farm shop, plant sale, ice cream cart and cafe (although the queue was long so probably better taking a small picnic). Then after my eldest consulted our map we decided to head for the adventure playground. We found it tucked in the woods and I've got to say it's one of the best playgrounds we've been to, there were swings, slides, tyres, climbing frames and stepping stones galore all made out of natural products which blended nicely into their woodland setting. There were also a couple of dens made entirely of twigs and branches which delighted my children when they realised how good they would be for their favourite game of hide and seek. I had to tear my children away from the play area with the promise of animals! We again consulted our map and located a pig sty which housed half a dozen friendly pigs. We stopped for a few minutes to say hello before deciding to have a little walk through the woods down to the boathouse by the lake. This was a nice gentle walk in which we spotted lots of wildlife along the way. The walk had so many wonderful views of the countryside and I definitely want to return to see more of it. After our walk, we thought we may as well have a quick look around the house as entry was included in our entrance fee. We had to leave our buggy at he entrance and carry our 1 year old around the whole house. I've got to say I wasn't too impressed with the house, in particular a few of the guides were un-welcoming towards our children. Harry and Heidi however seemed to enjoy it and especially enjoyed trying to find 10 miniature Roman's around the house (which we achieved). They also enjoyed exploring the secret hideaway in the children's bedroom in which adults weren't allowed. Overall, I will definitely visit Wallington again but next time I'll be better equipped and take a picnic, ball games and we'll go for a longer walk. It was an excellent way to spend an Afternoon in the country. Blue reef aquarium - why we won't be going back!